Fifty-seven years ago, my grandfather left his job at a shoe store and started an advertising agency. He had a desk, a chair, and a phone. For many years, my grandma did the book-keeping. It was a start-up, a family company, in every sense of the word. Today, his company, the one my dad owns and operates, the one I work for, the one my mom works for, the one called Clayman Advertising, is still around. Maybe you know other stories like this, and maybe, inspired by someone’s luck and success, you are thinking about embarking on the entrepreneurial journey yourself. Before you take that thought process any further, I highly recommend you read Carol Roth’s The Entrepreneur Equation (NOT an affiliate link). As fate would have it, I had started reading Napoleon Hill’s classic, Think and Get Rich, right around the same time Carol sent me her book to review. I decided, after reading the first chapter in both books, that I would alternate chapter by chapter, and if you can get your hands on booth books, I can’t recommend this exercise enough. Napoleon Hill’s book is about a century old. In his book you can find everything you might have learned from other people about starting your own company. If you adjust your thinking, send out positive vibrations into the world, believe that you can do it, and work hard toward your goals, you can achieve the American Dream. How does Carol begin her book? By suggesting that the American Dream can’t really be achieved in the same way it was a century ago. See, in the old days, innovations weren’t happening as quickly as they are now. There weren’t 77 different types of soda. There weren’t computers, let alone five trillion brands of television. There weren’t marketing messages coming at you from every space possible. The economy was not global. Now, you will encounter market saturation in almost any industry that you choose to join. Your competitors are not just domestic. They might be Australian or Japanese or Chinese or British. You need to be able to navigate your way from the American dollar to the Euro. Things have gotten a lot more complicated. In fact, when I talked to my dad about this reading experience, he said that if my grandpa was setting out now the way he did in 1954, he probably would not be able to succeed. One of my favorite movie moments occurs in the not too well known movie Erik the Viking. An island is sinking, but the king, played by John Cleese, says, “No, do not be alarmed. The island is NOT sinking!” He continues to say this even as his head falls below the surface of the water. If you are thinking about starting your own business, you need to be built up, and you need to believe in yourself, but you also need to go in with your eyes wide open. To me, reading Think and Get Rich in combination with Carol Roth’s Entrepreneur Equation can get you to both places. Here are some key ways both of these books together can get you on a straight and narrow path towards deciding whether you want to start your start-up. • Where Hill notes that you need to establish what your desires are, Roth makes you sit down and analyze your true motivation for wanting to start a business. • Where Hill notes that you need to have a plan and recite it to yourself every day, Roth makes you flesh out that plan with things you may not be thinking of. Are you going to have enough room to sit an extra employee at a desk? Are you going to be able to cover the cost of making whatever you’re making? • Where Hill notes that you need to have a Master Mind group, Roth notes that anyone whom you let into your inner circle when you’re starting a business will feel like they, too, are owners of your company. This is especially true if your master mind group is also your group of investors. • Where Hill notes that you need to have faith, Roth reiterates that you need to have understanding, too. Although I don’t own my own business, I know a reasonably large amount of stuff about what goes into running a company. My dad had to check in for phone messages when we took family vacations, and then when email came around, he never felt like he could leave his computer off for too long. I know the stress, the joy, the roller coaster versus the merry-go-round sensations, and a lot of the other things Carol covers. She doesn’t leave too many parts of the equation untouched. On the other hand, having gone through the experience of trying to carve myself a niche in the online world over the last year, I also know that what Hill talks about – faith, belief, a willingness to fail (but early and quickly) are all important too. If you don’t think you can, no one else will think you can either. 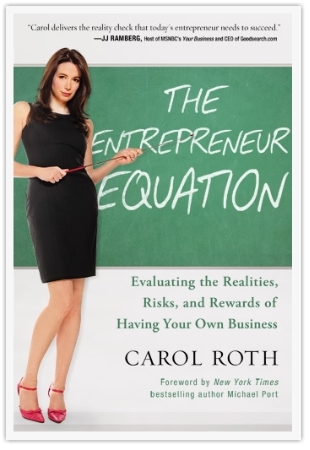 Check out Carol Roth’s Entrepreneur Equation. Do the homework if you are really serious about starting your own company. Take the time now, before you put your house up as collateral or go into massive debt. A few days of reading and thinking is an okay investment, don’t you think?